Amidst the discussions about content standards, curriculum and teaching strategies, it's easy to lose sight of the big goals behind education, like giving students tools to deepen their quantitative and qualitative understanding of the world. Teaching for understanding has always been a challenge, which is why Harvard’s Project Zero has been trying to figure out how great teachers do it. Some teachers discuss metacognition with students, but they often simplify the concept by describing only one of its parts -- thinking about thinking. Teachers are trying to get students to slow down and take note of how and why they are thinking and to see thinking as an action they are taking. But two other core components of metacognition often get left out of these discussions -- monitoring thinking and directing thinking. When a student is reading and stops to realize he’s not really understanding the meaning behind the words, that’s monitoring. And most powerfully, directing thinking happens when students can call upon specific thinking strategies to redirect or challenge their own thinking. His research shows that when fourth graders are asked to develop a concept map about thinking, most of their brainstorming centers around what they think and where they think it. “When students don’t have strategies about thinking, that’s how they respond – what they think and where they think,” Richhart said. Many fifth graders start to include broad categories of thinking on their concept maps like “problem solving” or “understanding.” Those things are associated with thinking, but fifth graders often haven’t quite hit on the process of thinking. Ritchhart studied 400 students at a school focusing on cultivating a culture of thinking. The study had no control group, but Ritchhart could chart development of metacognition from 4th-11th grades. “Students basically made a two-and-a-half year gain from what would be expected just from teachers trying to create that culture of thinking,” Ritchhart said. He admits that the study isn’t definitive, but to him it’s proof that when teachers focus on these ideas they do see improvement. Building explanations, interpretations and theories. One example of this that goes beyond the K-12 classroom comes from Harvard Medical School, where instructors were struggling to train students to listen to patients and make strong diagnoses based on the symptoms they heard. As an experiment, the medical school offered an elective module to students, where once a week they would join a fine arts class using the “See, Think, Wonder” thinking routine to observe art. After 10 weeks, all the medical students were assessed on clinical diagnosing and the students who had done “See, Think, Wonder” had improved much more than those who had not participated. “One of the reasons we call them thinking routines is that through their use it is the thinking that becomes routine,” Ritchhart said. 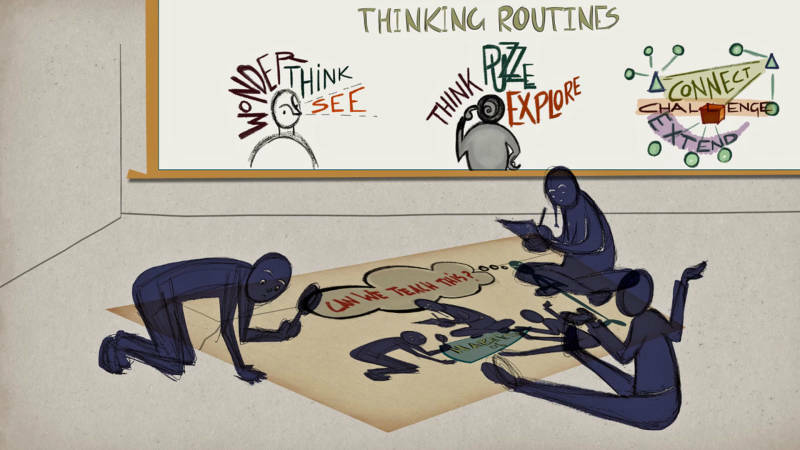 Project Zero is working with teachers around the country to apply thinking routines in the classroom and many have reported that after doing the routines in a structured way several times students naturally start using the protocols for everything.